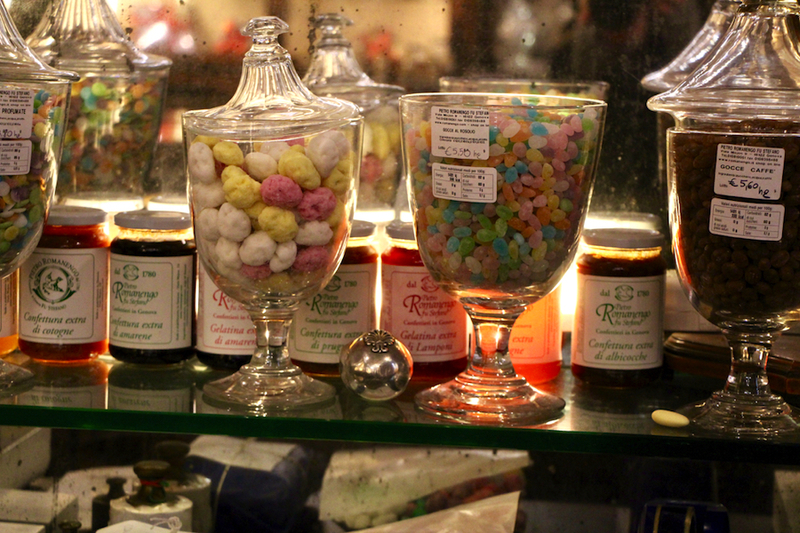 Many candy stores claim to be the oldest in Italy and yet I haven’t found one place that beats Pietro Romanengo, a two-hundred-year-old confectionary shop located in the historical center of Genoa. The confectionary first opened its doors in 1780 and has been a family-owned business ever since. But is it really the oldest in Italy? 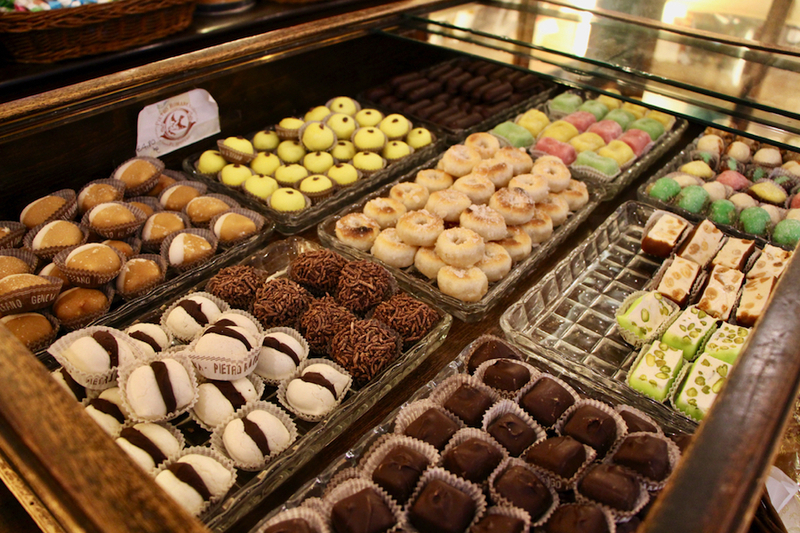 Pietro Romanengo states that they are a confectionary according to the definition of the 1700s. In other words, you won’t find rainbow lollipops or artificially flavored jelly beans here. This is a place reserved for purer kind of sugar, with sweets such as candied fruit, jams and decadent liqueur-filled chocolates. Unlike what is found in much of today’s industrially produced candy and chocolate, many of the ingredients that make up Pietro Romanengo’s products originate from raw natural sources such as fruit, flowers, cocoa, sugar and even spices. During its two-hundred years of doing business, Pietro Romanengo has had orders from prominent figures from all around the world, including Giuseppe Verdi and the Duchess of Parma, not to mention several prominent Genoese families (Doria and Grendi just to name a few). 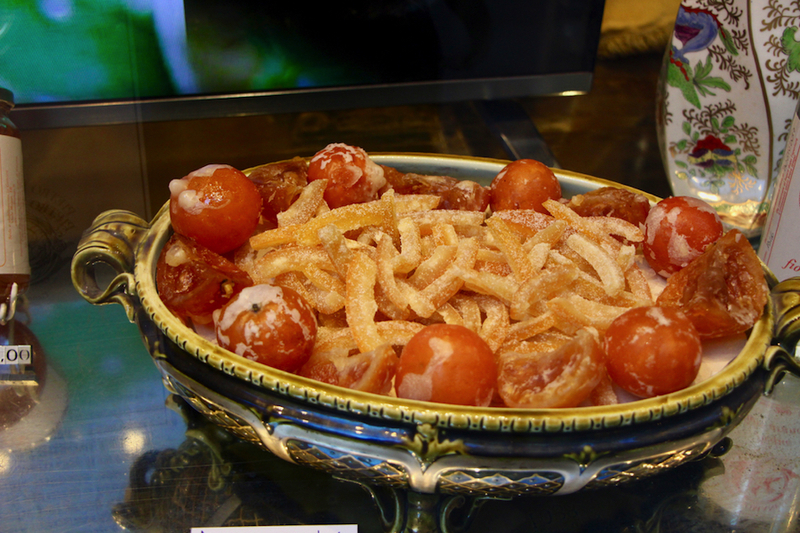 Nowadays the confectionary still remains intact, a symbol of the old Genoese wealth as well as an important historical gem protected by the city. When you walk into Pietro Romanengo, the immediate impression is that of an old-fashioned pharmacy, only with a Willy Wonka-esque allure. Everything from the packaging to the decor in the shop has been preserved or restored to the way it was in 1780. Glass chandeliers hang from frescoed ceilings, while the wooden cabinets and marble countertops display elegant glass jars filled with colorful pastel candies. However, what stuck out to me the most were the mirrors: stained and scratched, they reveal slightly blurry reflections that seem to only add to the magic of the place. In order to maintain its antique status, the company continues to produce its sweets using the similar production methods of the 18th century. Much of this process is done by hand, which means they must carefully follow each step of production from start to finish. Each room in their workshop is dedicated to a different process from chocolate molding to creating colorful fondants and liqueurs. Once the sweets have been made, they are hand wrapped as precious gifts, each with with an elegant blue ribbon and a card bearing the proud name of Pietro Romanengo. This craftsmanship not only requires attention and skill, but also a careful selection of ingredients. Unlike many modern confectionaries, Pietro Romanengo strives to use the best natural ingredients on the market and maintains a zero-preservative policy. While some of their creations are available year-round, others are purely seasonal when certain ingredients are at their best. Their sweets cost more than the average, yet the top-quality makes them well worth the extra few euro. Perhaps their mission statement says it best: “This is the art of the confectioner: the art of preserving the products of nature and imitate the appearance and taste of sugar with skilled workmanship”. While this mission might not seem so obvious by simply peering through the shop window, it becomes fully apparent when you bite you into one of their candied fruits or chocolates. It doesn’t taste like candy per se, but rather leaves traces of the original, raw product on your tongue. A candied mandarin, taste like a slightly sweeter mandarin, while a chocolate filled with mint crème, tastes of fresh, sweet mint. You can make a reservation to tour their laboratory or schedule a tasting through their website or by calling +39 010 819051. Please note that there are two locations in Genoa: Via Roma 51R and the original location, Via Soziglia 74r.